As they grow into adulthood, the magical abilities of red pandas begin to show. They possess the uncanny ability to find anything, living or otherwise, regardless of its location. However, no one has ever been successful at training one of these creatures to discover a target without attacking or destroying it. Even if the animal in question is much larger than the red panda, the action taken by your pet is always the same. 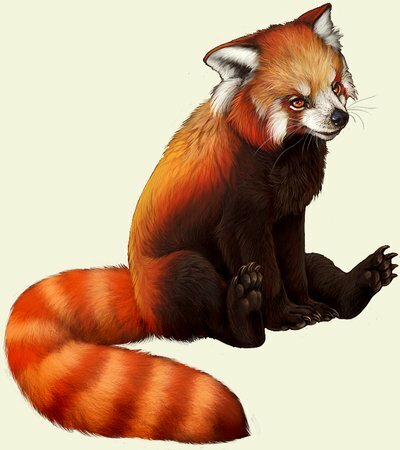 If, perhaps, a magi comes along and aids in the great battle, or even forces the red panda to relinquish its enemy, the red panda will celebrate its supposed victory and demand treats. Despite being difficult to handle, red pandas make good traveling companions, their nocturnal natures and powers being rather helpful. It is an unfortunate fact that these creatures are becoming harder to find. They live deep in forests, and usually only a red panda can find another red panda. In the lands to the east, where these creatures are originally from, they are thought to possess unflagging bravery, and are revered. Their offspring are generally taken in by the village folk and raised to adulthood because the numbers of red pandas are declining. Sweet looking as they are, red pandas can be nasty creatures, and a magi would do well to be aware of their teeth. Found far to the east, these mammals live on bamboo, insects, eggs, and whatever small animals that are foolish enough to wander too near. They make their homes high in the tree tops, and are fiercely protective of their young. It can come as quite a shock to have one of these creatures viciously attack you from above in the middle of the night. To those who have made a red panda their companion, though, they exhibit better natures. Despite their weight, they will climb on your shoulders and lovingly comb through your hair, only occasionally ripping some out. Whatever food you may be eating is assumed to be theirs as well, although they will happily repay you by guarding your door, leaping at any would-be attackers. Though they look quite a bit like the raccoons around The Keep, their beautiful reddish coats and magical abilities mark them as different.